Brett Blankner is an ultra-endurance athlete, coach, and host of the Zen and the Art of Triathlon Podcast. In less than one year, he ran 100 miles non-stop, swam the length of Lake Tahoe (22 miles) in 13 hours, completed two Ironman triathlons (2.4 mile swim, 112 mile bike, 26.2 mile run) and also swam from Alcatraz Island to San Francisco. He powers all this on a vegan diet while also working full-time and raising his seven year-old with his wife, Emily. You can find out more about Brett online. About one and a half years. My energy levels are much higher and more consistent. Using great nutrition to open up so many more doors in life. It’s amazing what you can do with your body and mind! Twice a day. Two hours a day on weekdays, four hours a day on weekends. Yes! I am a certified triathlon coach and you can find out more about my coaching online. I am an Ironman triathlete, ultra runner, and adventure swimmer. That being vegan makes you physically weaker. I show them my race results before and after going vegan and the difference is huge. I have a much faster recovery time after a race or hard workout because the nutrition is so much better. This allows me to get back to training sooner, so I am able to keep improving while others are still recovering. I have to travel to most races, so finding healthy food on the road or at the airport is sometimes difficult. I can do it, but what is most heartbreaking is how our food system is set up to make everybody fail. It should be harder to eat bad food than good food, and the opposite is true. 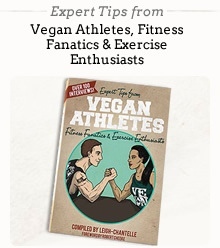 Vegans are definitely becoming a known force in endurance sports. It really works and this sport is basically about pushing your body to the limit for hours or days. If anything is going to help, people will do it. Being vegan has proven to be a competitive advantage for those of us that give it a try. I recommend it, unless you're my competition. If you're racing against me, then by all means, eat all the meat you can find. Just kidding. Mostly. Some friends are, others laugh at it. It is not something I worry too much about it because the results speak for themselves and are pretty obvious. When you take over an hour off of a twelve hour race simply by going vegan, you don’t worry about what somebody that is very overweight and out of shape says. My wife is vegetarian and definitely gets a kick out of watching me try to take it all to the next level. out that you are a vegan and how do you respond? “Where do you get your protein from?” Honestly, I thought this was a big issue as well until I learned that plants have tons of protein in them. Oatmeal has more protein than eggs! Rich Roll is a prominent vegan endurance athlete and opened my eyes to what this eating style can do for us. It was amazing how it turned his health around and since he’s a public figure, it was easy to follow suit. He’s even got a cookbook on his website that you can order to eat like he does. Breakfast - Ezekiel cinnamon and raisin cereal with coconut milk and some coffee. Lunch - I go to a local burrito shop called “Freebirds” and get a hand-made burrito. I have them put in beans, greens, corn, salsa, guacamole, and roasted peppers and onions. It’s awesome! Dinner - Peanut butter and jelly sandwiches, greens, Indian food, lots of great stuff and pretty random. Snacks (healthy & not-so healthy) - I make a green smoothie every day with kale, fruit, and carrots in it. It’s fantastic! I also like to snack on Lara Bars. Protein - I don’t worry about it too much. Protein is in nearly everything. Calcium - Kale and other greens. Iron - Beans and greens are very high in iron, so I’m doing really well. Simple carbs like dates or bread pick me up the fastest, but they also fade quickly. I add in nuts and seeds if I need more staying power and that works very well. Not really. A little B12 here and there, but that’s about it. Gaining muscle - Definitely lifting weights. It puts on muscle really fast. Losing weight - Eat whole foods and stop eating a little before feeling full. Maintaining weight - Nuts and oils have all the calories you could want and can help put on weight fast. Improving metabolism - Weight lifting and running. Toning up - Swimming HARD and weight lifting. I post pictures on Twitter of what I eat, then turn around and post the results of my workouts. Showing how I do a 60 mile bike ride at 20 MPH after eating vegan all week really makes people start considering eating more healthy food. I also host a popular triathlon podcast called Zen and the Art of Triathlon and talk about it there. I never tell people they have to eat this way. Rather I lead by example. Triathlons come in all sizes and distances. Most are quite short and fun. You can easily find one in your area on Active. Once you start training for one, you’ll notice you don’t anywhere near the energy it takes to get all of the work done without cleaning up your diet. That’s where I show up with a big bag of kale and a smile.